Primary wave X within the double zigzag of cycle wave IV is now complete. At the low labeled primary wave W this downwards wave subdivides perfectly as a three wave zigzag. Because a new low was made after this zigzag was completed cycle wave IV cannot be over there, it must be continuing. At cycle degree the structure unfolding is most likely a double zigzag. It may also be a double combination, but that would normally have a deeper retracement for the X wave; this upwards correction for primary wave X is relatively shallow and fits better the normal form for an X wave within double zigzag. 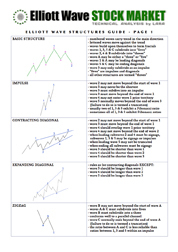 At this stage primary wave X is a complete flat correction because intermediate wave (A) within it subdivides as a three wave zigzag, and intermediate wave (B) is a corrective structure that is just over 100% the length of intermediate wave (A). Intermediate wave (C) subdivides nicely as a five wave impulse and has no Fibonacci ratio with intermediate wave (A). Primary wave Y has begun and is most likely to be a large zigzag trending downwards. It should last months and take price to new lows. When the intermediate degree waves (A) and (B) within it are completed I can calculate a target for it to end. I cannot do that yet for you. Within the zigzag of primary wave Y no second wave correction (or B wave) may move beyond the start of the first wave (or A wave). 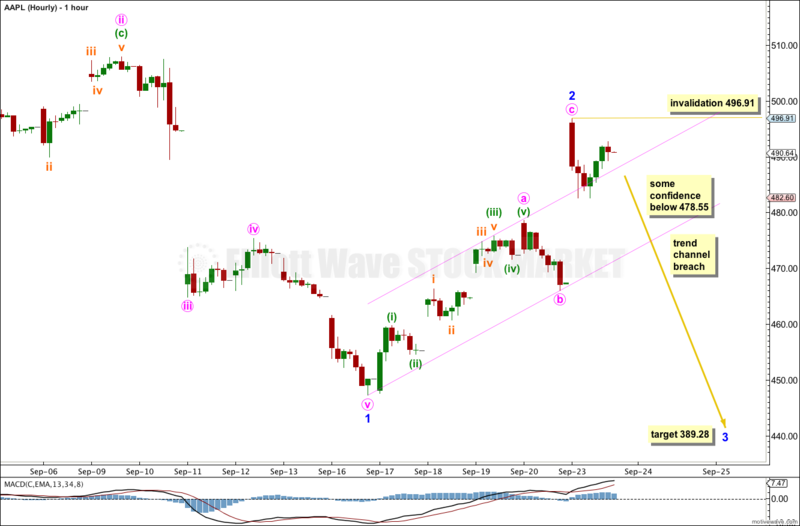 This wave count is invalidated with movement above 513.74. Minor wave 2 is most likely to be over as a very deep zigzag correction. However, I want to see a trend channel breach before I would have confidence in the target. At 389.28 minor wave 3 would reach 1.618 the length of minor wave 1. Within minor wave 2 minute wave c is 0.42 short of equality with minute wave a. 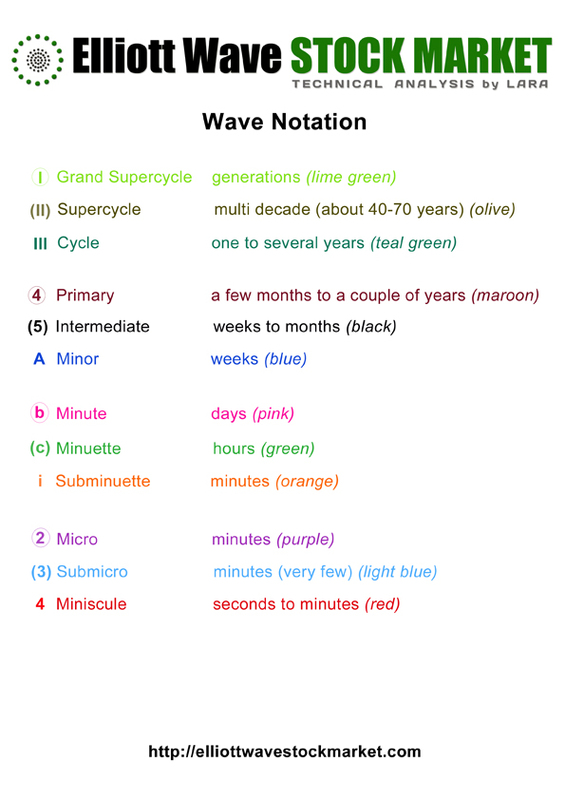 Ratios within minute wave a are: minuette wave (iii) is 1.08 longer than 1.618 the length of minuette wave (i), and minuette wave (v) has no adequate Fiboancci ratio to either of minuette waves (i) or (iii). I would have some confidence in this wave count with price movement below 478.55. At that stage downwards movement could not be a fourth wave correction within a new upwards impulse, and the movement labeled minor wave 2 would be confirmed as a completed three wave structure. A clear breach of the parallel channel would provide trend channel confirmation that minor wave 2 is over and minor wave 3 is underway. Within minor wave 3 no second wave correction may move beyond the start of its first wave. 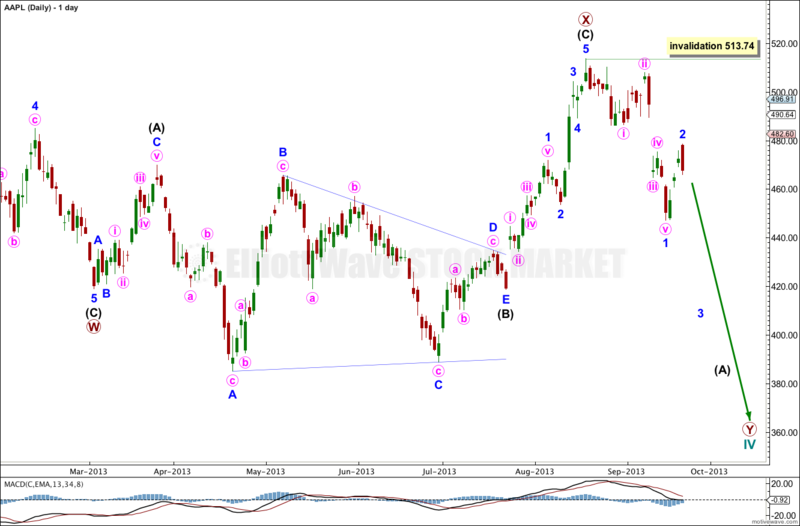 This wave count is invalidated with movement above 496.91. If this wave count is invalidated with upwards movement then I would expect minor wave 2 could be continuing further as a double zigzag or double combination. The invalidation point for that alternate idea is at 513.74.